Horse chestnut trees across Yorkshire could start to produce smaller conkers because of a new invasive moth. The Horse Chestnut Leaf Miner moth was first seen in the UK when it arrived in London in 2002. Since then the moth, Cameraria ohridella, has quickly spread north, arriving in Yorkshire last year. Biologist Dr Darren Evans, of the University of Hull said: "The moth cannot kill the tree but disfigures it and it produces a smaller conker." Dr Evans, lecturer in Conservation Biology said: "The moth has spread very fast, it is almost impossible to eradicate them." Infected trees have been found across Yorkshire including confirmed cases in Hull, East Yorkshire and Leeds, West Yorkshire. The most northerly sighting so far has been in Danby, North Yorkshire. Severely damaged leaves shrivel and turn brown by mid-summer and fall early, well before the autumn, giving the unsightly impression that the tree is dead. Dr Evans is looking for information from the public on the health of horse chestnut trees across the region. "We are just as interested in trees that have not been infected, that is useful information," he added. This newly arrived species has caterpillars that live inside the leaves, forming distinctive patches of damage called leaf mines. 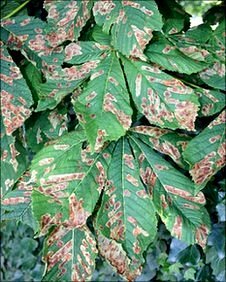 Dr Evans said: "The whitish blotches on horse chestnut leaves during the early summer are an indication that the 'alien' moths have arrived." Up to 700 leaf mines have been recorded on a single leaf and the damage caused by large numbers of larvae can be striking. The moth has a natural pest in the form of tiny parasitic wasps that kill the developing moths. Researchers at the Universities of Hull and Bristol have developed a phone application that automatically uploads photos taken of horse chestnut leaves to a special Leaf Watch website. The website can log the tree's location and help to build up a picture of which areas are suffering from the infection. Verified records of infestation will added to a national database which records the spread of the moth. Is there an alligator in this Ontario creek?